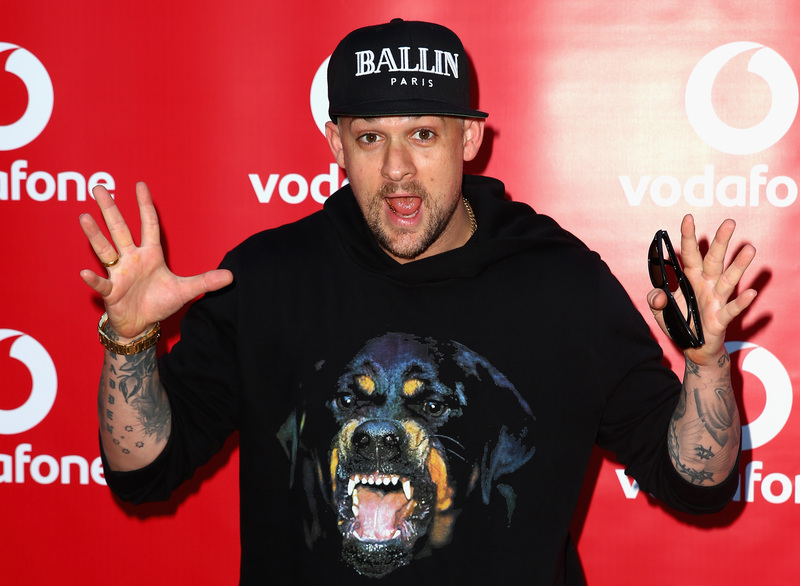 Since they were first reported to be dating in May of last year, everything in regards to Benji Madden and Cameron Diaz's relationship and marriage has moved QUICKLY. The couple was engaged after seven months together and pretty much got married right after that, in a secret star-studded ceremony on Jan. 5. Well, it's no secret that apparently these two are very passionate individuals and seem to be madly in love with each other (remember that adorable kiss cam vid?) and now Madden has taken their relationship up another notch. Madden got a tattoo of Cameron Diaz's name which he revealed on his Instagram account on Feb. 23 and it is BIG. I have to admit, my immediate reaction to seeing the photo was a big outcry of "OH NO!" Why, you ask? Well, sure, plenty of normal folks get regrettable tattoos, but in the history of celebrity couplings, when one of the parties gets a tattoo dedicated to their current lover, it just doesn't bode well for their future. Even some of Madden's fans took to the comments to share their concern, with one fan sharing, "Aaah! Dude, don't ever get a chicks name tattooed on you. #instantcurse #letshopenot." Look, I am rooting for Madden and Diaz all the way because I believe in a thing called love, but let's hope that this really adorable declaration doesn't turn into a really awkward touch-up session at the tattoo salon like it has for these celebs in the past. This might be the most well-known of ex-lover tattoo mishaps. Depp and Winona Ryder were one of the hottest couples of the late 80s and 90s, and Depp got a "Winona Forever" tat on his arm to commemorate his love. Unfortunately, their love did not last forever and he swiftly altered the name to say "Wino Forever." Who knows what that means, but it's better than having your ex on your body, I guess? Marc Anthony and Jennifer Lopez were married in June 2004, after years of being friends. The couple announced their divorce in 2012, and Anthony already had Lopez's name inked on his wrist. Once they announced their separation, Anthony covered up his Jennifer tattoo with the Statue of Liberty in honor of his then new girlfriend, Shannon De Lima. Will they ever learn? Bailon knows a thing or two about regretting getting an exes name on your body. She famously had Robert Kardashian's full name tattooed on her behind and it remained there five years after their split, but she began removing it in 2014. A year earlier on her show The Real, Bailon shared of the tattoo, "It's awful... I made a very bad decision." Jolie and Billy Bob Thornton were also in a super passionate love affair, full of awkward PDA and vials of blood around each others' necks. Normal, eh? The couple were so in love, Jolie got Thornton's name tattooed on her arm, and although they seemed perfect for each other, the couple didn't last. To cover up the name, Jolie tattooed the coordinates of her and her children's birthplace, adding her now husband Brad Pitt's in 2011. The actors were married from 2002 until 2006, in were involved in a very messy divorce. When they first got together, Sheen had his wife's name on his wrist and Richards put Sheen's name on her ankle. After their divorce, Sheen went on to totally remove his "Denise" tattoo and Richards had her "Charlie" tattoo covered up by a fairy drawing. Seems like Jolie was following the Melanie Griffith school of how to proclaim your love. After Griffith and her now ex-husband Antonio Banderas announced their divorce after 18 years of marriage, she was seen covering up her "Antonio" banner across her arm and began the slow process of removing it with laser treatments. Ugh, when Heidi Klum and Seal announced they were separating, my heart was crushed. They were definitely one of my favorite celebrity couples and I totally thought they were in it for the long run. It seems like they did too. Klum had an abstract tattoo of Seal's name across her forearm, with the initials of their children within three stars. Following their divorce she proceeded to remove Seal's name but kept their kids' names. Sad face.